Google Chrome will soon be available on the App Store, according to according to Macquarie analyst Ben Schacter. 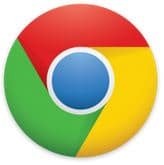 “Google Chrome browser for iOS is coming”, Schacter wrote in a report earlier this morning. Schacter also stated that Apple may already be reviewing Google’s submitted code for a Chrome browser for iOS.” According to Schacter, we can expect to see Google Chrome in the App Store for iPhone, iPad, and iPod touch as soon as Q2 but if not this quarter, then definitely this year. He says this is a big deal because Google would no longer have share about 50%-60% of revenue made through Safari searches on iOS devices with Apple. This would allow Apple to keep all their revenues by not having to share it with Apple. Early this year Google released Chrome beta for Android smartphone and tablets running Android 4.0 ICS or later.